"Oh Christmas Tree ! Oh Christmas Tree ! 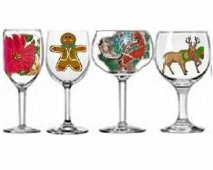 Thy leaves are so unchanging"........This lovely Christmas carol could definitely be singing about our hand painted Christmas Tree Wine Glasses. 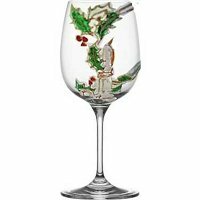 Our Hand Painted Christmas Tree Wine Glasses are rich in vibrant Christmas colors of red and green, and the off beat branches give an eclectic look to Christmas. Why I think Scrooge might peak around the corner. I am having a Christmas party and ordered 12 of these. They came out beautiful. I am so excited. Thank you so much. My guests will love them. I am coming back for more.